Learn about local government and economic development groups' opposition to canceling thousands of future oil and gas wells and canceling 65 local oil and gas contracts 10 years after they were awarded. Under pressure from extreme environmental groups and Pitkin County, the BLM is considering canceling and/or modifying 65 oil and gas leases. These leases together represent thousands of acres of land and thousands of acres of future drilling locations in Mesa, Rio Blanco, Garfield, Delta, and Pitkin Counties. Cancellation of these leases would mean lost revenue to local governments and fewer jobs. These leases are more than ten years old and many of them have currently producing gas wells on them. Thursday, May 1st, 3:00 p.m at the De Beque High School Gymnasium, 730 Minter Avenue, De Beque, CO 81630. Cross Orchards Opens for the Season May 1st. Regular site hours will be most Thursdays – Saturdays from 9:00 am to 4:00 pm. Cost is $5/adults, $4/seniors, $3.50 for kids 3 – 12, and families are $15. Admission free to members. Spring Day on the Farm on Saturday, May 3rd from 9 am - 3 pm. There will be bee keeping, wood working, blacksmithing, cookies baked on the woodstove, prospecting, Uintah train tours, model train displays and the Wheels West Car Club will be showing off some of their antique and vintage vehicles. Baby farm animals provided by local 4-H kids will be the frosting on the cake! Monday, April 28, 2014 was a significant day in the local economic development world. The first of what officials hope will be a long list of Mesa County businesses applied to the County Commissioners for a tax incentive. Local economic development professionals believe this incentive will generate employment opportunities right here in Mesa County. The incentive has been available for eighteen months. Originally introduced following the passage of legislation in 2012 (C.R.S. 30-22-123) this allows Colorado counties to reimburse a company up to 100 percent of the county's share of business personal property tax revenue for up to a decade, if the business invests at least $1 million into moving into or expanding existing operations in the county. On Monday, agreement was reached between Mesa County and Reynolds Polymer Technology, Inc. concerning Personal Property Tax Incentive Payments. Reynolds Polymer applied for the tax incentive to promote economic development activities within Mesa County and generate employment opportunities for Mesa County Residents. The tax incentive calculation is a bit tricky to compute. It is based on mil levy and purchase price of equipment. In the case of Reynolds Polymer, the incentive will not be received until 2016, and when it is, will total $6,249.00. Incentive values for the years following 2016 will be less due to depreciation. “A business owner considers all the cost of doing business in an area. Taxes are a part of that equation. A $6,249 incentive might not seem like a lot. However, it does make a difference. That money can be reinvested in the business, in the local labor force,” explains Diane Schwenke, Grand Junction Area Chamber of Commerce. Mesa County has major bridges inspected once every two years. We have been notified that the bridge over the OMID canal on F 1/4 Road at 37.9 (1st bridge just west of Talbott's packing shed) needs to be load limited. The posting will be placed by 18 April 2014. 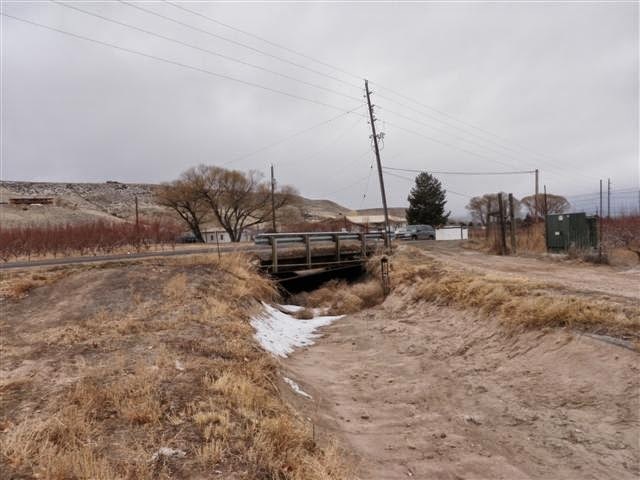 Please note Mesa County is aware this bridge is very important to the orchard, vineyard, and agriculture businesses, and the residential community. We are developing a plan to minimize interruption during the repair of the bridge. At this point we plan to make repairs from the surface and will not need to drain the canal. We are working closely with Orchard Mesa Irrigation District to minimize or eliminate any interruption to delivery of irrigation water as well. Mesa County is planning to begin the repairs starting the first of May and will be completed by mid-June. If you have any questions please call 970-244-1765. 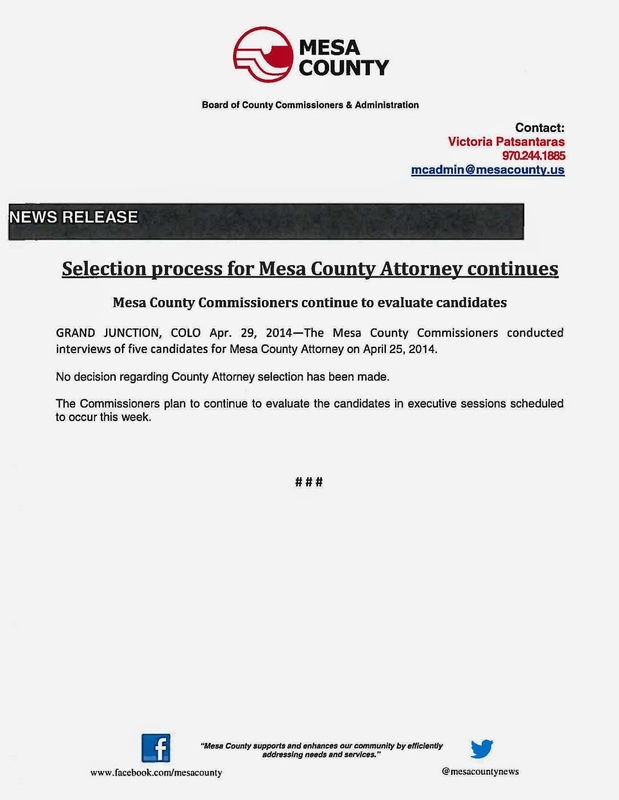 The Mesa County Commissioners conducted interviews of five candidates for Mesa County Attorney on April 25, 2014. No decision regarding County Attorney selection has been made. The Commissioners plan to continue to evaluate the candidates in executive sessions scheduled to occur this week.